Removals Company Blandford Forum, Woods Removals Ltd. 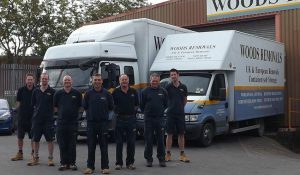 When you need a removals company in Blandford Forum, you need look no further than Woods. With a century-and-a-half of experience, there’s nothing about packing you up and getting you from A to B that we don’t know about. Our BAR-certified (British Association of Removers) team is dedicated to the art of removals and it’s an art we’ve been perfecting for a long time. We never stop learning, hearing our clients’ feedback and making the service better and better. Moving home is an uncertain and potentially stressful time, so we go that extra mile so that we can be there for you throughout the process. It needn’t be an ordeal. Get in touch and our estimator will visit you to get the full picture and draw up a clear and accurate quotation. We’ll then plan your move carefully so that you get a seamless and stress-free experience. We can pack up all your belongings and we’ll make sure we have exactly the right equipment and materials so that everything, including difficult objects like pianos and paintings, gets handled the right way. Your possessions will be securely loaded in our vehicles and kept utterly safe in transit. At every juncture of the process, our 140 years of experience comes into play, giving us an advantage over other removal companies in Blandford Forum. We have a variety of additional services, including office moves, European moves and international moves. Furthermore, if you need storage in Blandford Forum, your won’t be disappointed by our spotless and spacious facilities. All manner of circumstances can lead to the need for storage. It could be that you’re downsizing or caught up in a moving chain and having to rent for a while, consequently needing somewhere to offload your furniture temporarily. Whatever the case, our storage centre will suit your requirements. However many of our services you need, one thing you can be certain of is that all come with a degree of professionalism over and above expectations. At Woods, we want you to be able to relax while we do the heavy lifting. Contact us today and we’ll get straight to work on your behalf.